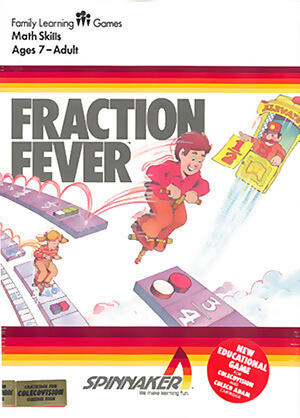 In Fraction Fever, the player's goal is to advance floors up to the twentieth with the help of his pogo stick and the Fraction Elevators located on each floor. To find them, the player needs to look for the correct fraction pictures, matching what is shown at the top of the screen, while a radar shows the layout of floors at the bottom. Incorrect fractions can be knocked down for scoring points, but this leaves holes in the floors. When the player doesn't manage to jump over these and falls down far enough or several times, the game will end. There is also a time limit to look out for, if the clock reaches zero the Fraction Elevator of the current floor cannot be reached, and the player has to jump down a floor to be able to try again.